I feel like I should point out that I am more than halfway through my 38th week, meaning I am practically 39 weeks, meaning we are practically to the end. And at the end, every single day seems to matter!!! This post could probably get really whiney really quickly. For a few weeks now I have had what is referred to as "pregnancy induced carpal tunnel". Basically my right had feels like it is asleep or numb more than half of the time. Which obviously feels awesome. I am also feeling more and more tired and wanting to sit around more and more. My feet and hands are swelling. My boots have been tight on my feet for a few weeks now, but at church on Sunday it was really hot and I could feel my feet ballooning up so bad that I wanted to rip my shoes off right then and there. In other news, I installed the baby's car seat in my car last week. And I set out a bag to pack for the hospital. I was thinking I will make a list of what I want to go in it, so I don't really have to think about it while I am in labor. Other than that, I feel like everything is as done as it can be. I do make sure to make the kids lunches every evening, just in case I go into labor that night, so whoever comes to watch the kids doesn't have to worry about that. I found out at my last appointment that the kids can't come see me and the baby in the hospital and I was rather bummed about that. The midwife said I could get around it by having the kids waiting in the hallway when they transfer me from labor and delivery to postpartum, but honestly I think that would be especially hard and confusing on Callum and I am sure hard on Isla too. Who wants to see their mom and new sibling for just a minute then be forced away from them? Confusing. So I am thinking FaceTime will have to do...and maybe I can convince someone to bring them to the parking lot so I can wave at them from my window. I always get stressed out about the other kids when I am stuck in the hospital. I was 1 cm dilated at my appointment on Monday. 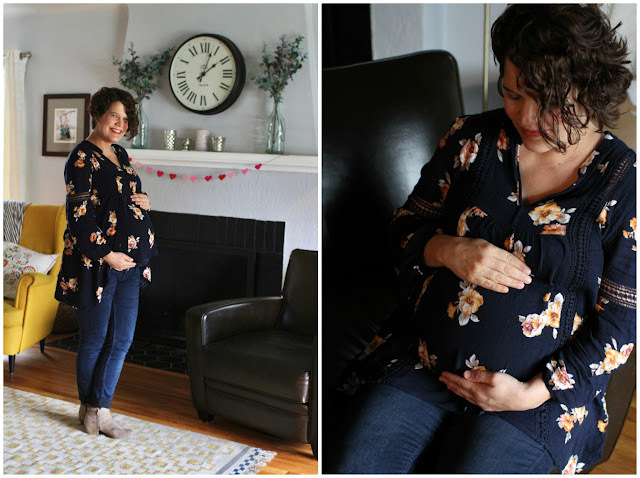 The midwife thought I would make it to my 39 week appointment, but not my 40 week. So that's encouraging. But, I am also convinced they really shouldn't have changed my due date by an entire week during my first trimester. My hope has been all along that because of that, the baby will come a few days early. Because a girl can hope, right? !